With Skylanders Swap Force being released in October for PS3, XBox 360, Wii and Wii U you might not realize that a Nintendo 3DS version is also being released. 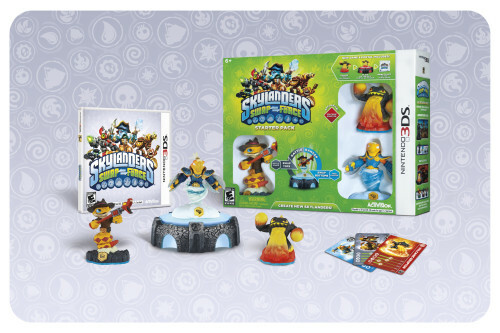 With each release of a Skylanders Game there has been a separate 3DS game put out as well. In the past the 3DS game had the same figures that the full console games had except they had one special figure not found in those sets. 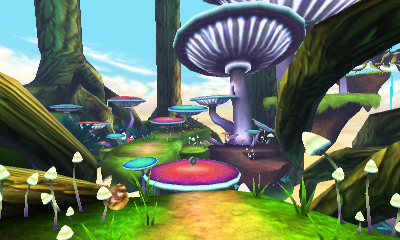 For Skylanders Spyro’s Adventure there was Dark Spyro. For Skylanders Giants there was Punch Pop Fizz. Those figures eventually got released in very limited quantities as single pack character but when the game is initially released that is the only way to get the character. With the release of Skylanders Swap Force the 3DS version is going to come with two two Swap Force characters, Rattle Shake and Free Ranger that can swap their tops and bottoms as well as Volcanic Eruptor (A series 3 figure which is a repose of a character that has been in all 3 releases of the game). The full console game is going to come with Swap Force characters Blast Zone and Wash Buckler. So I am really excited that by getting both the console game and the 3DS game you are not getting any duplicate characters. The full details about this game can be found after the jump. Skylanders SWAP Force gives kids an unprecedented level of choice by allowing them to swap the top and bottom halves of the toys to transform 16 SWAP ForceTM characters into more than 250 unique combinations3. Skylanders SWAP Force on Nintendo 3DS is compatible with all of the toys from Skylanders Spyro’s Adventure® and Skylanders Giants; additionally, all of the characters’ abilities, levels and customization will carry forward to Skylanders SWAP Force. 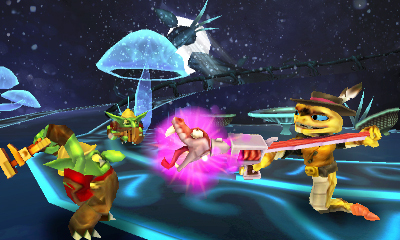 Like the game’s console version, the level cap for all characters has been raised from 15 to 20, enabling players to continue building the skills and experience of their favorite Skylanders. Headquartered in Santa Monica, California, Activision Publishing, Inc. is a leading worldwide developer, publisher and distributor of interactive entertainment and leisure products. Activision maintains operations in the U.S., Canada, Brazil, Mexico, the United Kingdom, France, Germany, Ireland, Italy, Sweden, Spain, Norway, Denmark, the Netherlands, Australia, mainland China and the region of Taiwan. More information about Activision and its products can be found on the company’s website, www.activision.com. 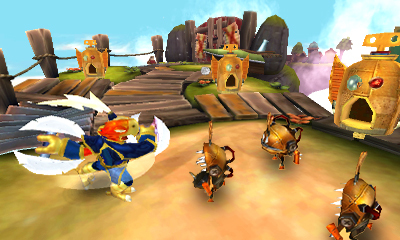 Cautionary Note Regarding Forward-looking Statements: Information in this press release that involves Activision Publishing’s expectations, plans, intentions or strategies regarding the future, including statements about the expected release date of SKYLANDERS SWAP FORCE, are forward-looking statements that are not facts and involve a number of risks and uncertainties. Factors that could cause Activision Publishing’s actual future results to differ materially from those expressed in the forward-looking statements set forth in this release include unanticipated product delays and other factors identified in the risk factors sections of Activision Blizzard’s most recent annual report on Form 10-K and any subsequent quarterly reports on Form 10-Q. The forward-looking statements in this release are based upon information available to Activision Publishing and Activision Blizzard as of the date of this release, and neither Activision Publishing nor Activision Blizzard assumes any obligation to update any such forward-looking statements. Forward-looking statements believed to be true when made may ultimately prove to be incorrect. These statements are not guarantees of the future performance of Activision Publishing or Activision Blizzard and are subject to risks, uncertainties and other factors, some of which are beyond its control and may cause actual results to differ materially from current expectations. SKYLANDERS, SKYLANDERS SWAP FORCE, SWAP FORCE, SKYLANDERS SPYRO’S ADVENTURE, SKYLANDERS GIANTS and ACTIVISION are trademarks of Activision Publishing, Inc.